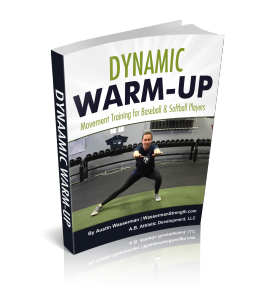 This Dynamic Warm-Up will guide your athletes through general and specific movements geared for baseball and softball players. This is the most effective & productive way of warming up compared to static stretching. Continuous movement increases blood flow and increases core body temperature. Static stretching actually decreases body temperature. Helps young players learn their bodies while they are adapting to rapid growth. Prepares the mind for activity. This is the time to focus! It’s not meant to tire the athlete out completely. Distance is 10-15 Yards.